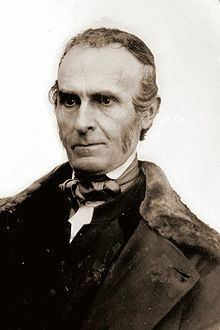 The author of this beautiful and well loved hymn, "Dear Lord and Father of Mankind", is John Greenleaf Whittier (1807-92). He was from Massachussetts and wrote poetry and found early inspiration from Robert Burns. He spent time as journalist and editor and became Secretary of the American Anti-Slavery Society. This hymn was written against the background of boisterous revival meetings of the time. He was a quaker who believed in worshiping God in silent meditation and deplore the histrionics associated with the Evangelical movement. He originally wrote this poem as a meditation poem and did not expect this hymn to be sung. It should however be pointed out that he did allow the verses to be used in a hymn book published in 1884. This hymn has long been regarded as an excellent statement that Christians should learn the virtue of silence and humility before God. From this they will learn what is the will of God. Below are the lyrics of this hymn, "Dear Lord and Father of Mankind."